A hydrant is an outlet from a liquid (e.g. water, fuel) usually comprising a vertical pipe with a valve attached to it. This valve is used to tap the fluid. A yard hydrant is a water fixture commonly used in farm operations. It is also used to supply water for gardens in suburban yards. Frost-proof yard hydrants are specifically designed for outdoor use in the climates where temperatures remain below zero degree for the major part of the year. To install your own frost-free yard hydrant, dig a hole in the ground to a depth below the frost line. If you don’t know what the frost line is, it is the depth of the ground that reaches freezing temperatures during the winter seasons. Frost line varies from area to area, so check with your local geological department for the frost line of your area. If the hydrant is situated at the end of the water line, you will need to attach a valve or elbow to the bottom of the hydrant to control the water supply. However, if the water line continues to other fixtures, use a T-fitting instead of elbow. Attach the water line to the fitting at the bottom of the hydrant (elbow or T-fitting) using an appropriate method, depending upon the nature of the existing water line. Water pipes made up of synthetic material such as PVC are connected to the hydrant using glue. If you are connecting the hydrant to a metal water line then you may need to make cutting threads into the water pipe. Fill the base of the hole with half inch gravel to a level at least three inches above the drain opening at the base of the hydrant. To test the functioning of your newly installed frost free yard hydrant, allow the water to flow in the line. When the valve is open, water should come out of the faucet opening. When the valve is closed, water should drain into the gravel area at the bottom of the hydrant. 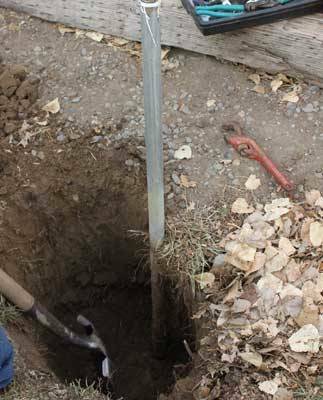 Once you are satisfied with the functioning of your frost free yard hydrant, fill the rest of the hole with the soil. Make sure the hydrant remains vertically straight when adding the soil to fix it in place.